Regis E. Niver Eggleston, 97, a resident of the Rouse Warren County Home and formerly of Youngsville, PA. died Monday evening, January 30, 2012 after an extended illness. She was born March 28, 1914 in Warren, PA. to the late Samuel and Margaret Morlock Niver. She had resided in Youngsville and was a 1932 graduate of Warren High School. Regis was employed as a psychiatric aide at the Warren State Hospital for 3 years. She was a member of St. Luke’s R.C. Church, the church altar rosary society, Youngsville Senior Center. 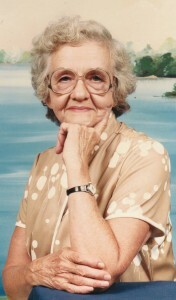 She was an avid reader, enjoyed gardening and especially her roses. She loved doing handiwork. She is survived by 6 Daughters – Elizabeth Hoffman and husband, Ralph of Warren, PA., Diane Hoh of Austin, TX., Linda Hagberg and husband, John and Margaret Brunecz and husband, David all of Sugar Grove, PA., Mary Passinger and husband, Robert of Youngsville, PA., Sarah Eggleston of Atlanta, GA., 3 Sons – John E. Eggleston and wife, Karen, James M. Eggleston and wife, Vicky all of Warren, PA., Thomas J. Eggleston and wife, Charlene of Titusville, PA., 1 Sister – Carol Hampson and husband, Jack of Zanesville, OH, 23 Grandchildren and 30 Great Grandchildren, 1 Great Great Granddaughter, several nieces and nephews also survive. In addition to her parents, she was preceded in death by her husband, John F. Eggleston who died March 12, 1983 whom she married November 18, 1933 in Warren, PA., Infant son in 1936, 1 Brother – Samuel J. Niver, 1 Sister – Gretchen Niver. The family will receive friends at St. Lukes R.C. Church Friday from 9 to 10:00 A.M. in the gathering space. A Mass of Christian Burial will be conducted Friday at 10:00 A.M. with Rev. Fr. John Neff, Pastor, officiating. Interment will be in Youngsville Cemetery, Youngsville, PA.
Those wishing to place memorials may do so through the Hospice of Warren County, 2 Crescent Park, Warren, PA. 16365 or the Warren Public Library Association, 205 Market Street, Warren, PA. 16365 or the Friends of the Rouse, 701 Rouse Avenue, Youngsville, PA. 16371. Those wishing to submit e-mail condolences may do so by visiting www.lewisfuneralhomeinc.com. The Donald E. Lewis Funeral Home, Inc. has been entrusted with funeral arrangements. I was sorry to hear about your mother’s passing. I only met her once when she came to see one of the plays, but I know she played a very central role in your lives. You have my deepest sympathies. My thoughts and prayers are with you all in this difficult time. God Bless. To the family, especially Betty, Diane and John as you are the ones who will remember me. My deepest sympathy. Your mother was a lovely lady and fortunate to have had a loving family. We, your H&R Block family, wish to extend our deepest condolences to you and to your family. We’re sure you will have lots of wonderful memories of your beautiful grandmother. May God give you comfort, consolation and healing at this very difficult time. My family’s thoughts & prayers go out to the family of Regis Eggleston. I enjoyed my time with her. What a wonderful woman she was! Regis will be missed by all who knew & loved her! My sincere condolences. I know I will miss Regis a great deal. Our thoughts and prayers are with all of you during this time of loss. Spending time with your family is a wonderful childhood memory of mine ! Your mom and dad had the best sense of humor and were always welcoming to all of your friends. I remember your Mom and what a wonderful Lady she was and the love y’all had in the family. Prayers and loving thoughts come up from Texas for you. Tim and I send hugs and love to you and your family at this sad time. Sorry that we will miss seeing you, as business has us out of town. Knowing how kind and thoughtful you are must be a great testament of what a kind woman your mother must have been. I am sorry you lost your mother. I know she loved you very much and you will miss her greatly. Spend some time to reflect on her life and the impact that may made on everyone. Let me know if you need anything. Mary and Bob, we are thinking of you and your family during this difficult time. A loss at any age is never easy. Let us know if you need anything now or anytime in the future.